"Crime is afoot in Lewes, Delaware"
Buckingham Pet Palace is a daycare and spa for pets, run by the enterprising Sue Patrick, whom we met in the earlier Stay Calm And Collie On. Sue has a partner in the firm, Lady Anthea Fitzwalter from England, who now lives in Lewes, Delaware. 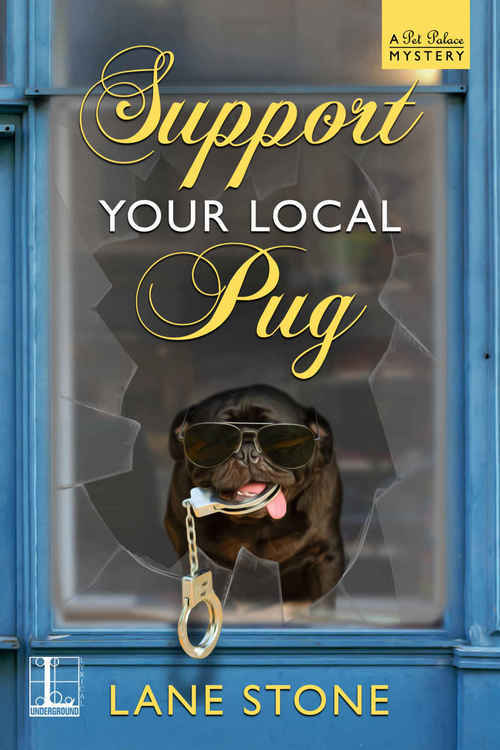 Time to SUPPORT YOUR LOCAL PUG in this highly engaging mystery tale. Sue is shocked awake by an alarm and races to her business premises, where the door is smashed and sacks of pet food have been stolen. Luckily her overnight staff had a routine which kept them upstairs in safety. The police chief, once he has a crime scene team present, sweeps Sue away because a dog has been heard barking out on a lighthouse island. They have to reach it by boat. While they rescue the abandoned pug, Chief John Turner frets that maybe he was lured out here. The worst has happened; someone has been killed at Sue's home. He was a worker at the German deli down the road. This makes no sense, and it's very distressing. Sue doesn't normally even lock her door. Actually, she's not security conscious. Looks like she was the one who was deliberately lured away from her location. There's an issue about a car involved at the two crime scenes; Sue immediately decides not to tell the chief that she knows the owner of a very similar car. I would assume the car had been stolen to use in the robbery, and I don't know why she didn't. Burglars don't use their own cars. A nice touch is that the town is celebrating finding artefacts from an eighteenth-century shipwreck in Roosevelt Inlet. Even this invites tension. Both the coast and dogs make frequent appearances in this fast-moving mystery, with the pets ranging from a Bernese Mountain Dog to a Dachshund and the aforementioned homeless pug, Wags. By halfway through the book I admit to getting tired of being reminded that Lady Anthea is, well, Lady Anthea. Every time she comes into the room it's Lady Anthea came in and Lady Anthea picked up a cup of tea. In her normal circle she's bound to be called Anthea or Bunty or something so why the heavy formality? She's not a head of state nor in a formal role in Delaware. It's like calling your friend Professor Anthea all the time. That aside, this is an interesting mystery with lots of character contrast which should suit all age groups. Lane Stone is clearly enjoying writing about her human and canine characters in the Pet Palace series so pick up a dose of crime with SUPPORT YOUR LOCAL PUG. Buckingham Pet Palace may provide services fit for a four-legged king, but there�s no use crying over spilled kibble�not unless it leads to murder! When a break-in at the Pet Palace robs Sue Patrick of more than her beauty sleep, she intends to tidy her ransacked doggy daycare and spa before making any rash decisions. But after Sue abandons her better instincts to rescue a petrified pug stranded at a lighthouse in the Delaware Bay later that morning, she�s lured off mainland Lewes long enough for a freshly murdered body to get dumped in her driveway . . .
Aided by Lady Anthea Fitzwalter, her practically royal business partner from across the pond, Sue sniffs out clues about the yappy pug with a complicated history and the old car spotted at both crime scenes in hopes of IDing the culprit. As the investigation leads them back to the bay, the ladies soon find themselves immersed in a case trickier than a canine agility course�and chasing after a well-groomed killer who will do anything to maintain a perfect reputation . . .